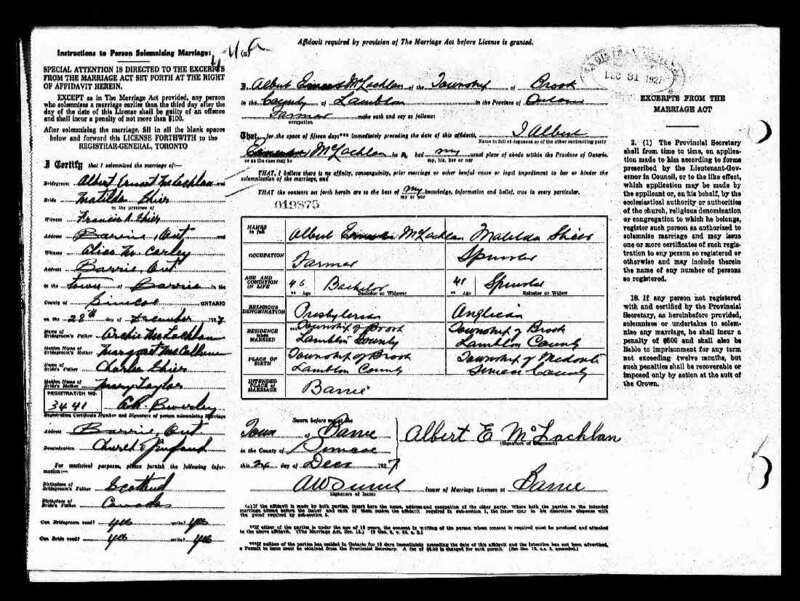 Marriage* Catherine McKinley married Woodbury CHESLEY (Charley) Lodwick, son of Christopher Lodwick and Jane White, on 29 December 1904 in Brock Twp., Sunderland, Ontario County, Ontario, Canada. 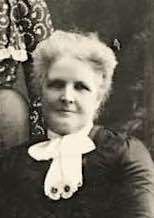 Marriage* He married Mary Helen Cooney on 22 February 1890 in Toronto, York County, Ontario, Canada. [S26] Unknown record type: unknown subject, by unknown photographer; unknown series; unknown repository, unknown repository address. Online unknown url; unknown file name, Death Records for Alberta Fischer. [S26] Unknown record type: unknown subject, by unknown photographer; unknown series; unknown repository, unknown repository address. Online unknown url; unknown file name, Death Records for Charles W. McKinnon. 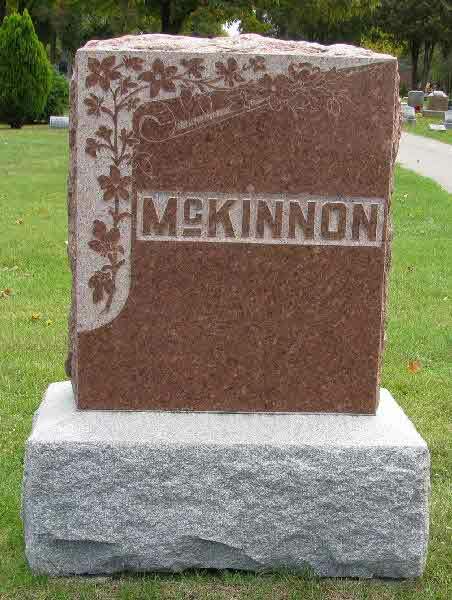 At the age of 66 H. N. McKinon died at the home of his daughter, Mrs. Amos Bulman, Saturday, havng been ailing for the past four years but confined to the home only since the first of the month succumbing to that general break down that is inevitable to all whom acute disease does not take off earlier. The funeral occured from the home Monday, Rev. O. F. Shaw preaching the sermon. Interment was made at Cherry Grove. Deceased was a native of Cannington, Ontario. There he grew to manhood. In the sixties he married Miss Rachel Shier. These sons and daughters survive from that union; Mrs. A. Bulman, of Clare; Mrs. Joseph Fisher of Elwood, Ind., and Mrs. Catherine Ross of Saginaw and Charles of Montana, all of whom but the last named were present at the funeral. One sister, Mrs. Dora Gent, of Bay City and one brother, Charles of Pennsylvania also survive. About 25 years ago, the McKinnon family moved to Michigan, temporarily residing at Loomis and then locating on an eighty acre farm in Sheridan. Five years ago he took up his home in Clare. Kind hearted to a very large degree, a good neighbor and loyal friend, he possessed any of the those qualities that brighten life for others and leave behind memories of good cheer and good will. 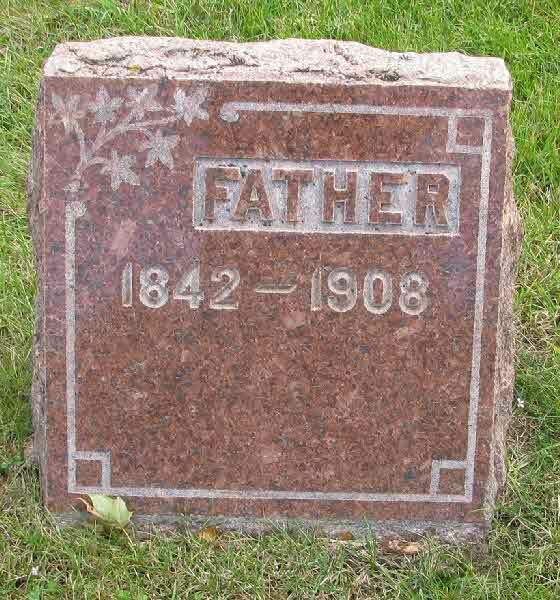 Burial* He was buried in Cherry Grove Cemetery, Clare County, Michigan, United States. 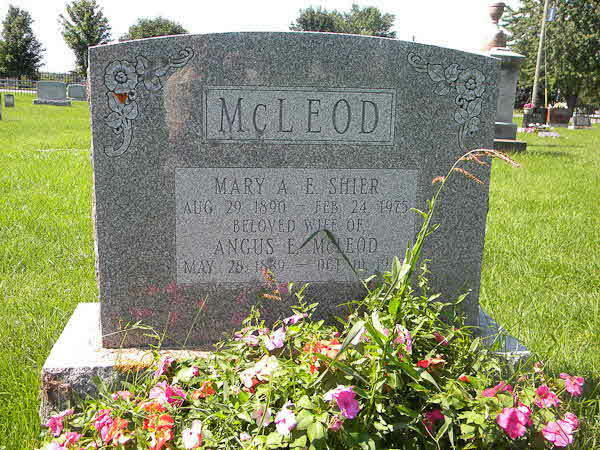 Marriage* She married John R. McGrath on 23 February 1918 in Flint, Genesee County, Michigan, United States. 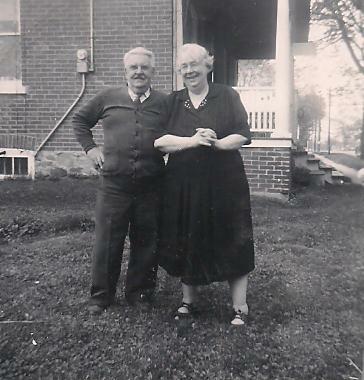 Marriage* He married Irene Winnifred Barton, daughter of George Wesley Barton and Edna Lillian Shier, on 23 September 1933 in Scott Twp., Leaskdale, Ontario County, Ontario, Canada. 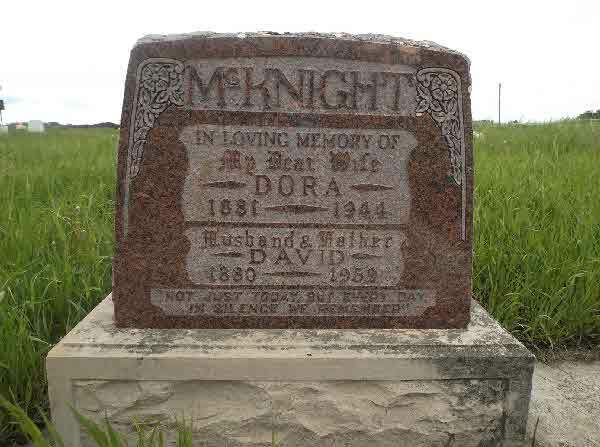 Marriage* David McKnight married Dora Parish on 8 February 1911 in Ontario County, Ontario, Canada. 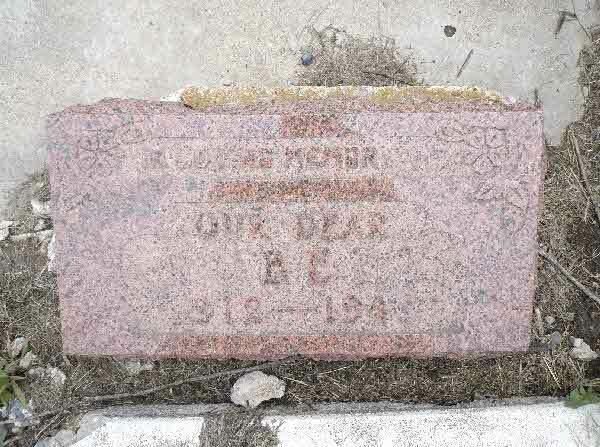 Burial* He was buried in Viewfield Cemetery, Viewfield, Saskatchewan, Canada. Birth* She was born on 8 September 1895 in Georgina Twp., York County, Ontario, Canada. 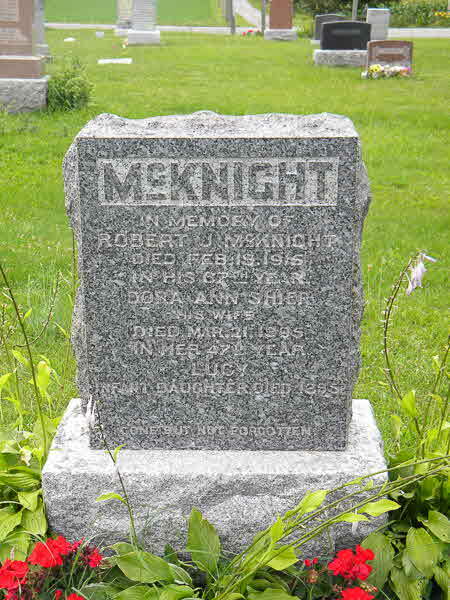 Burial* Lucy McKnight was buried in Bethesda Scott Cemetery, Scott Twp., Ontario County, Ontario, Canada. 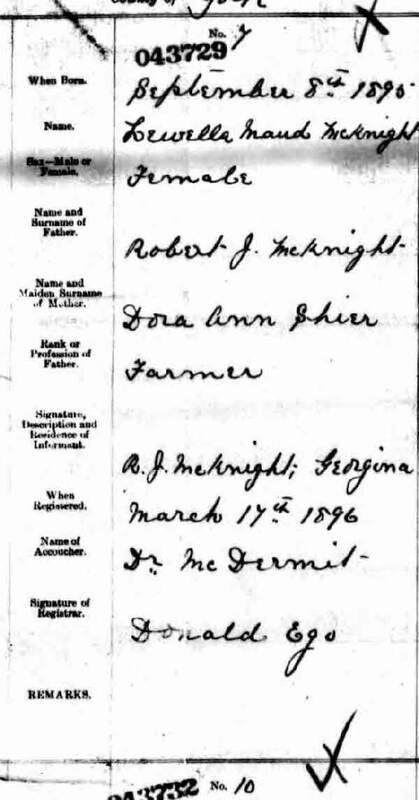 Birth* Martha Sophia Elizabeth McKnight was born on 13 December 1889 in Georgina Twp., York County, Ontario, Canada. Burial* He was buried in Viewfield Cemetery, Viewfield, Estevan Census Division, Sasktachewan, Canada. 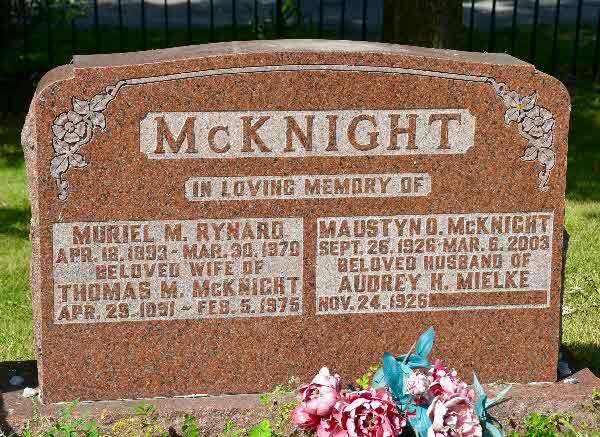 Birth* Robert George McKnight was born on 6 February 1888 in Georgina Twp., York County, Ontario, Canada. 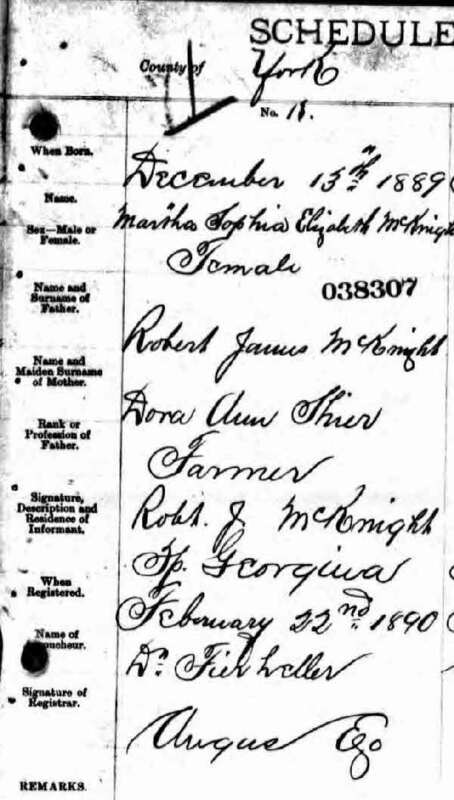 Marriage* Robert James McKnight married Dora Ann Shier, daughter of John Shier and Dora Sparling, on 6 March 1879 in Leaskdale, Ontario County, Ontario, Canada; Registration # 60697. Birth* Sarah Almida McKnight was born on 16 March 1884 in Lot 19 Conc. 6, Scott Twp., Ontario County, Ontario, Canada. Marriage* He married Matilda Shier, daughter of Charles Shier and Mary Taylor, on 28 December 1927 in Barrie, Simcoe County, Ontario, Canada. 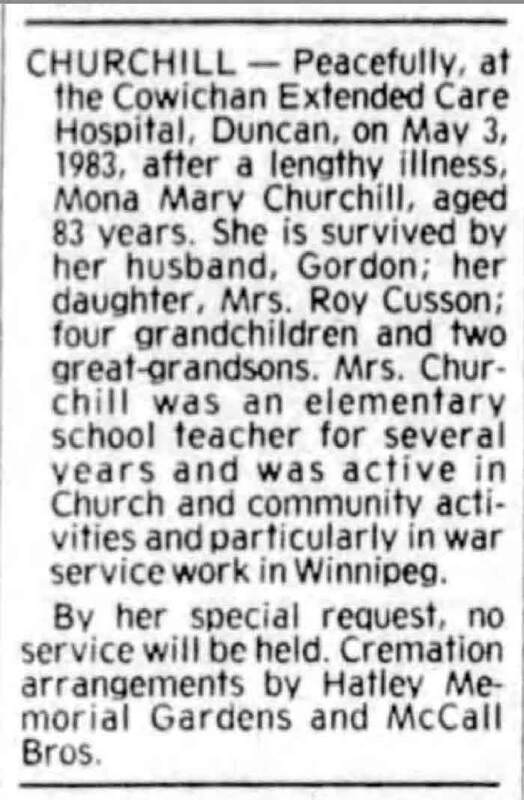 Death* Mona Mary McLachlin died on 3 May 1983 in Cowichan Extended Care Hospital, Cowichan, British Columbia, Canada. 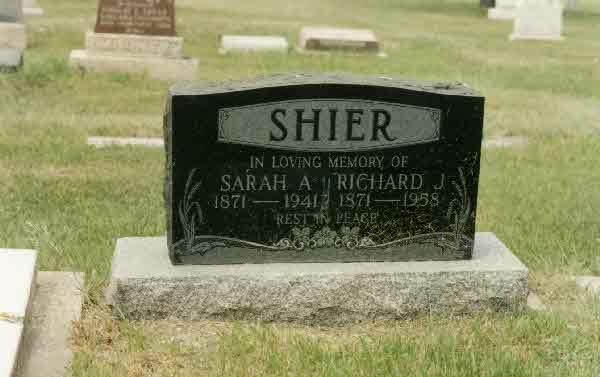 Marriage* She married Philip Shier, son of Philip Shier and Mary Ann Dawson, on 25 September 1879 in Fenlon Twp., Cambray, Victoria County, Ontario, Canada. Death* Jane (Jennie) McLaren died on 8 October 1880 in Mariposa Twp., Victoria County, Ontario, Canada. 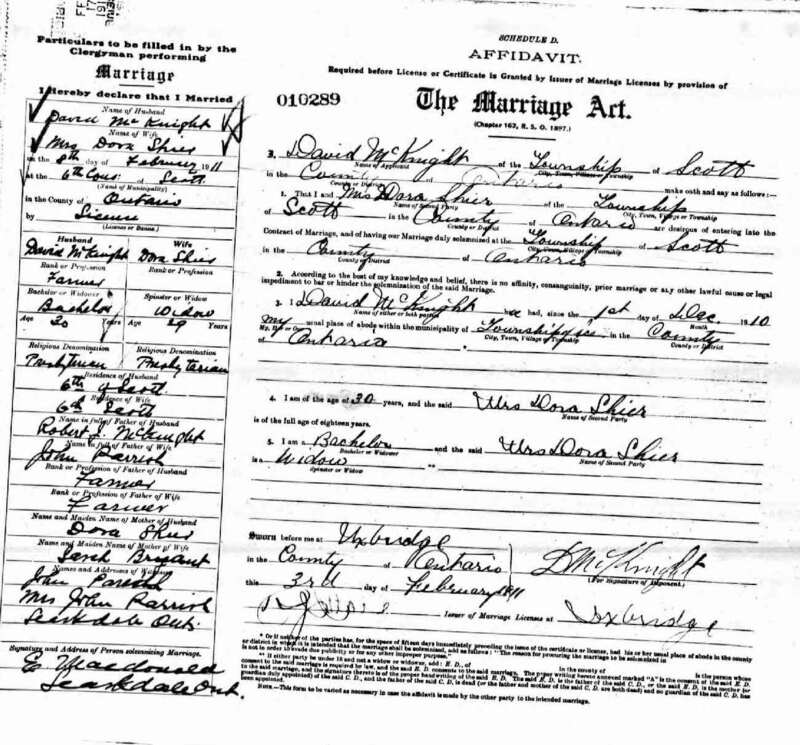 Marriage* Anne McLaughlin married George Hartwell Speiran, son of John (James) Speiran and Mary Ruttle, on 30 August 1869 in Ontario County, Ontario, Canada. 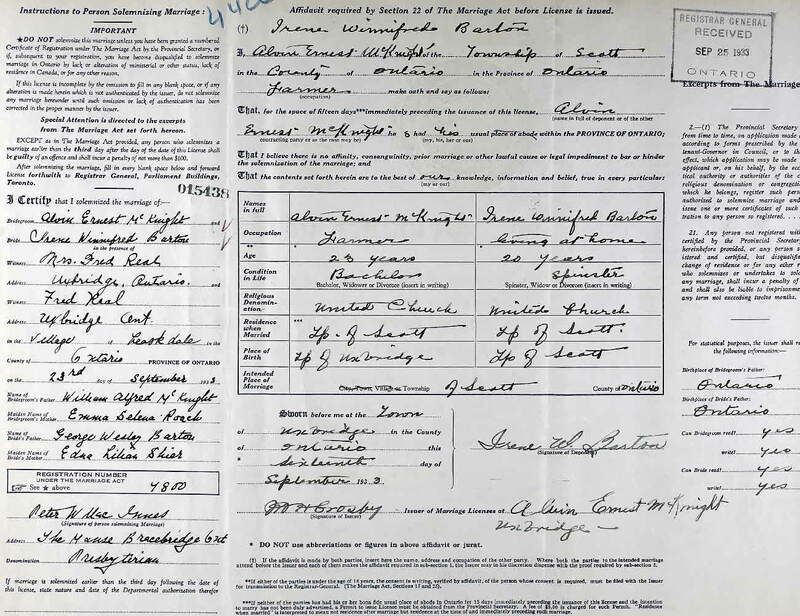 Marriage* Sarah Ann McLaughlin married Richard John Wesley Shier, son of Richard LOFTICE Shier and Mary Ann Speiran, on 12 July 1898 in York County, Ontario, Canada. (Witness) Fact 1 Sarah Ann McLaughlin witnessed the Fact 1 of Richard John Wesley Shier; Photo of Richard John Wesley Shier, his wife and two sons possibly in Regina around 1930. Death* Sarah Ann McLaughlin died on 8 September 1941 in Semans, Saskatchewan, Canada, at age 70. 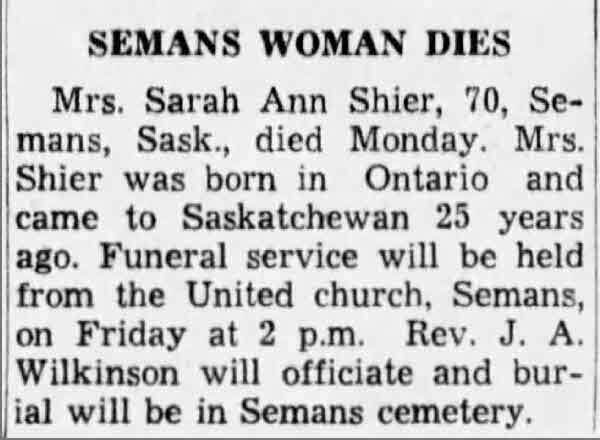 Burial* She was buried in Semans Cemetery, Semans, Saskatchewan, Canada. 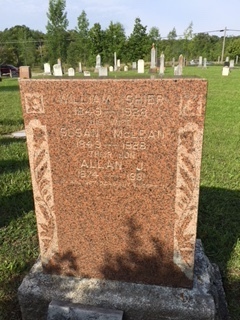 Marriage* Susan (Susie) McLean married William Shier, son of Adam Shier and Maria Conway, on 25 December 1872 in Brock Twp., Ontario County, Ontario, Canada. (Witness) Fact 1 Susan (Susie) McLean witnessed the Fact 1 of William Shier; Photo of William Shier/Susan McLean and Family. Death* Susan (Susie) McLean died on 7 July 1928 in Wiarton, Bruce County, Ontario, Canada, at age 78. Burial* She was buried in Big Bay Cemetery, Georgian Bluffs, Grey County, Ontario, Canada. 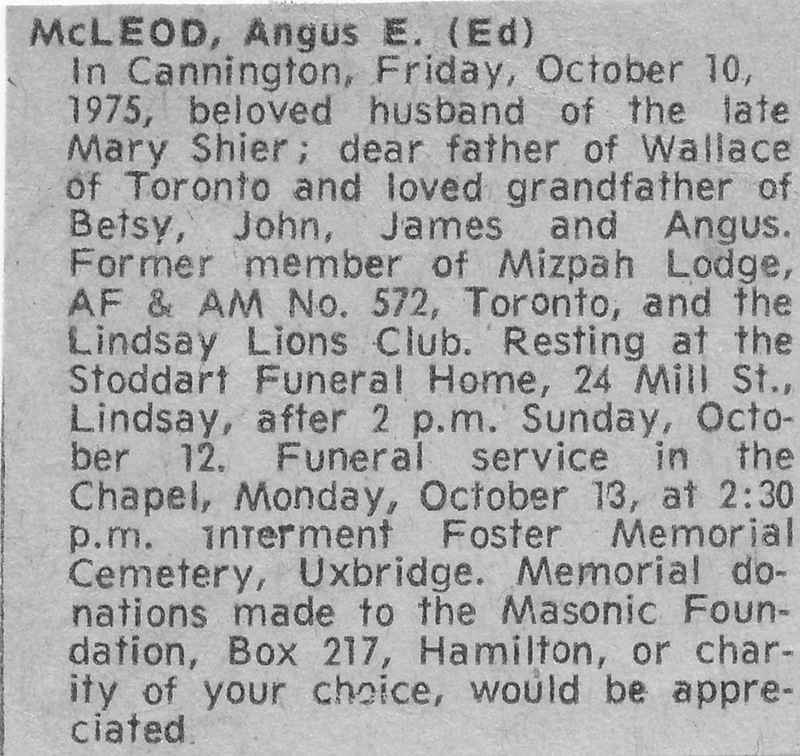 Death* Angus E. (Ed) McLeod died on 10 October 1975 in Cannington, Ontario County, Ontario, Canada, at age 86. 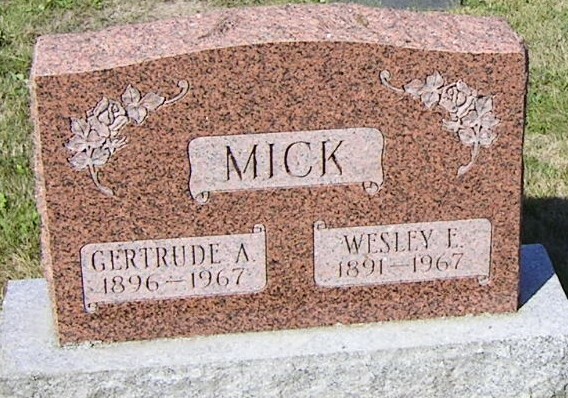 Burial* He was buried on 13 October 1975 in Foster Memorial Cemetery, Scott Twp., Ontario County, Ontario, Canada.